Dino Rizzo’s book “Servolution: Starting a Church Revolution through Serving” is an inspiring read. Rizzo, the lead pastor of Healing Place Church in Baton Rouge, Louisiana, founded the church with the intention of reaching out to the least of these. From its earliest days, Rizzo led the people of HPC to serve and care for the people of their community without expecting anything in return. Serving isn’t something the people of HPC think about doing, it defines who they are. One of the most challenging things Rizzo writes in his book is this: “If HPC closed down tomorrow, who would notice? Would there be an outcry from the city for us to keep our doors open?” Rizzo continues, “If Healing Place Church disappeared from the map and no one felt the loss other than those who attended services, then we would have failed miserably.” Now, that’s something to think deeply about! Rizzo’s question has haunted me since I read it. Would our community care if our church closed down tomorrow? The fact of the matter is that churches in our city and nation close their doors every week, never to open again. And perhaps sadder, their respective communities seldom notice or care. As I have contemplated Rizzo’s question something amazing happened in our community — the Gallery Furniture Warehouse burned to the ground. Well, that’s not exactly the amazing part of the story. What was amazing was the response of Houstonians. The day after the fire people from throughout the community drove to the Gallery Furniture location — some with checks in hand for the store owner and others prepared to purchase anything in order to help out. Gallery Furniture is not a church, but what happened there caught the attention of the entire community. There are several lessons that the church can learn from Mattress Mack, but I think that the most important lesson is the value of having an external focus. For Mack, Gallery Furniture is about more than making money or saving people money, it’s about doing something beyond the walls of the store that will make a difference in the lives of Houstonians. You can’t turn on the television or drive around our community without seeing advertisements for Gallery Furniture. Rizzo writes, “Remember, it’s not just about billboards, mail-outs, or phone directory ads. A name is just a name until you are able to make an impression of generosity and love for them to associate with that name.” Jim McIngvale understands that. When people think of Gallery Furniture they think about more than sofas and lamps. They associate the name with a man with a generous heart who is in business to help others. Church leaders and members should learn from the response of Houstonians to the Gallery Furniture fire and determine to develop an external focus. Reggie McNeal, author of “Missional Renaissance,” says that churches must move from being internally occupied to externally focused, and from primarily concentrating on institutional maintenance to developing an incarnational influence. He’s right. Church can no longer be just about us and what we do to benefit our members. Churches everywhere need to join the servolution and invest in their respective communities. Proverbs 3:3-4 states, “Do not let kindness and truth leave you; bind them around your neck, write them on the tablet of your heart. So you will find favor and good repute in the sight of God and man.” That’s solid advice. I’ve discovered that kindness can open the door for the truth. “Why are you doing this?” I am often asked while leading service initiatives around the community. I love that question because it is the sound of kindness opening the door for the truth. So, join the servolution and be Jesus with skin on to the people of your community. 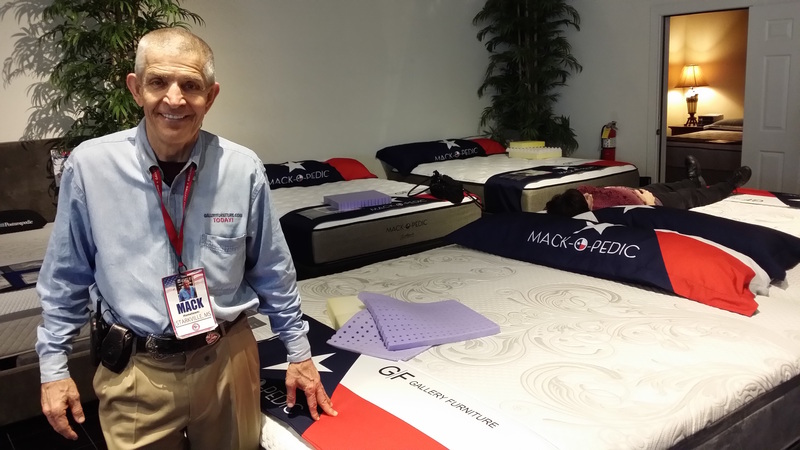 Thank you Mattress Mack for all that you have done and will continue to do for our community. You have set a great example for churches everywhere about what it means to be externally focused and to care for others. If our church ever burns to the ground, I hope that the people of our community will notice and care and cry out for us to rebuild. It’s amazing what the power of one can accomplish. We’re all accountable for what we do with what we have been given. Such truth in this post today… You are what you live. “Mack” seems to always be at his place, just inside the store…if you need help to find something, he takes you there personally. Each person is made to feel important. Back in the 60’s Mack spoke at an assembly full of highschoolers in the inner-city school where I began my teaching career. They were mesmerized by his energy, and by hearing how far they could go as well… by being purpose driven.